Our campaign and advocacy division seeks to complement the entirety of ANFREL’s work by bringing attention to electoral issues in the region. The goal of doing so is to strengthen the resolve of electoral actors in the region to improve elections and bring issues to the public’s attention to raise awareness about the need for improvement. Both will help raise the quality and value of elections. 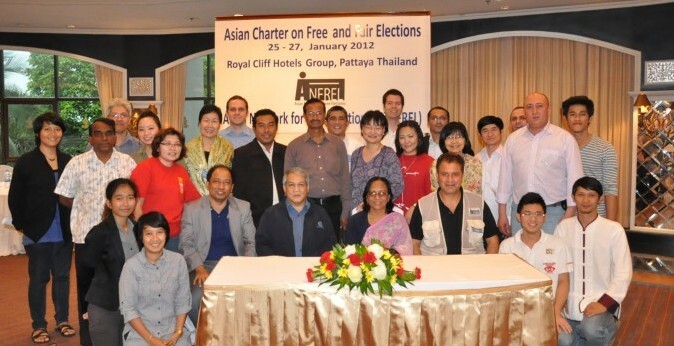 On December 10 and 11, 2012, representatives of Asian electoral management bodies and civil society organizations met in Bangkok for the first-ever regional gathering of these two often disparate groups to promote democratic, transparent elections on the world's most populous continent. The Asian Electoral Stakeholder Forum (AES Forum) convened a two-day conference with participants from 11 Asian electoral management bodies and 30 Asian civil society organizations (representing 17 countries) devoted to advancing the cause of free and fair elections. Guests from the Libyan, Australian and Mexican electoral management bodies, as well as observers from foreign embassies in Bangkok and from governmental and non-governmental bodies based in Europe and the Americas, were also on hand to witness the event. Attendees agreed that a Declaration of Principles could aid their efforts. It would serve to outline the challenges to elections in the region and raise solutions to those challenges using principles that meet accepted international standards for holding free and fair elections. However, they further agreed that such a Declaration must be sensitive to the culture, religion and customary practices in Asia while being reflective of the international norms reflected in such documents as the "Declaration on Criteria for Free and Fair Elections," adopted by the Inter-Parliamentary Council on March 26, 1994. In the past, people from many countries discussed the idea for a (non-binding) Asian agreement to complement the "Declaration on Criteria for Free and Fair Elections". Such a document would have its own character and be crafted to be suitable to the prevailing political and cultural conditions in Asia. Through discussions of aspirations and concerns aired by election stakeholders, election management bodies, civil society and election observer groups, an idea was born to organize a series of dialogues to draft such a document for guiding electoral processes more effectively throughout Asia. 1. Provide a sense of ownership to the peoples and election management bodies of Asia through the creation of a document that recognizes the sensitivities of culture, religion and customary practices in Asia. By engaging stakeholders in the entire process, from start to finish, the drafters of the Declaration established a legitimacy and ownership of democratic principles that is difficult to challenge or deny and, therefore, more readily implemented. 2. Focus the broad universality of international principles on specific issues applicable to Asia. A regional declaration helps to strengthen the application of the international principles in Asia. 3. Encourage the participation of women and minorities as voters and leaders. Women, in particular, are too often overlooked by society and have frequently been the focus of attempts to suppress their rights. The Declaration recognizes that women’s involvement must be encouraged without dismissing cultural considerations, as otherwise it may give rise more conflict than solutions. A regional declaration can ensure that women’s rights and the rights of minorities are not violated and that they are allowed full participation in the electoral process. In order to reinforce the efforts of each country and to build on the sense of common purpose, the second Asian Electoral Stakeholder Forum is being planned for late 2013/early 2014. Such a follow-up meeting will allow civil society groups and EMB's to compare progress being made in each nation and to reinforce the importance of their work in enhancing the electoral processes across Asia. It will also allow them to share strategies for the best ways of winning crucial support for implementation of the Declaration. While no one expects quick success, participants at the 2012 AES Forum are optimistic that the Bangkok Declaration will, in fact, point the way to the evolution of electoral processes throughout Asia.